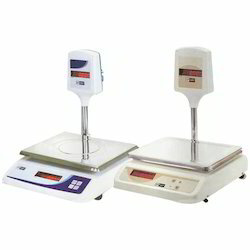 Prominent & Leading Manufacturer from Kolkata, we offer high precision balance, top loading triple beam balance, digital counter balance and chainomatic analytical balance. We are instrumental in manufacturing and supplying of a wide range of High Precision Balance that is used GMP, ISO and other quality management systems. These are known for their highest weighing accuracy and for optimum support in flexible application. 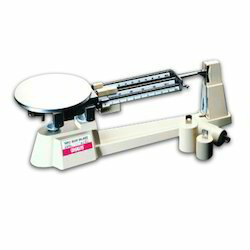 Precision-engineered balances are widely used in various industries, institutions and medical laboratories. We offer our clients, a comprehensive range of Top Loading Triple Beam Balance that is made using quality material and components acquired form the certified vendors of the market. The balance comprises three notched weighing beams along with center indicating sliding masses. Its has the total weighing capacity of 610 gm. Apart from this, additional masses are hanged on the end of the beam, which increases the capacity by up-to 2610 gm. When not in use, these can be stored in the recessed base with magnetic damping for quick weighing. We are one of the prominent manufacturers, suppliers and exporters of Digital Counter Balance that are known for their accuracy, durability, high performance and low maintenance. Our balances are tested and verified by the well reputed organizations. These are widely used in various industries, medical laboratories and shops. 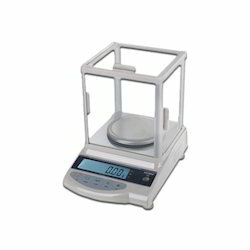 Our clients can avail from us, a wide range of Chainomatic Analytical Balance that is widely used shops specially in jewelery shops and in laboratories. These are available with golden chain and a wooden case with sunmica top. Our chainomatic balance is designed in compliance with indian and international quality standards, and can weight up-to 100 gm. We are looking Foreign/Export query. 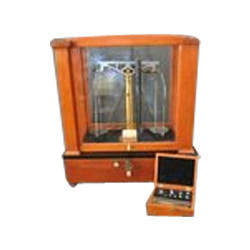 Looking for Laboratory & Mechanical Balance Equipment ?